We can all agree that moving is one of the most hectic experiences in life, requiring a lot of time, hard work, and patience. Whether you’ve moved once or a dozen times, the moving process is equally difficult each time. Luckily, with the help of moving companies and their professional staff, the process of moving is easier and less time consuming. Using portable moving containers during a move has now provided a more convenient and affordable option during the moving process. With this service, a moving container is dropped off at your home for you to fill with your items over a specified number of days. At a scheduled date, the container is then picked up and transported to your new residence. This hybrid moving service combines the affordability of a DIY move with the convenience of having someone else do the driving. PODS have been in business since 1998 and are considered to be the pioneers of the container moving business. They have services in Canada, Australia, and the UK, but only cover 44 states in the United States, excluding Alaska, Montana, North Dakota, Vermont, West Virginia, and Wyoming. On the other hand, rival U-Pack covers all 50 states in the United States, and has services in Canada, Mexico, and Puerto Rico as well. When selecting a company to use, make sure that they cover your area! Both PODS and U-Pack offer moving services to the majority of the United States. PODS come in three container sizes: 7 feet, 12 feet, and 16 feet, which hold anywhere from 1 to 4 rooms of furniture. The variety of sizes available allows for flexibility, as customers can choose the appropriate size for their needs. It’s important to note that only the 7′ and 16′ containers are available for long distance moves, while all three sizes are generally available for local moves. Additionally, PODS are designed without a ramp, making it much easier to load and unload than your typical moving truck. U-Pack only offers one container size for moving. Their container is called a ReloCube and measures 7′ x 6′ x 8′. This small container can accommodate approximately 2500 lbs. of household goods, or the contents of a one-bedroom apartment. U-Pack will drop off as many ReloCubes as you need, but will only charge for the number of containers you actually use. For example, if you reserve three containers, but manage to fit all of your belongings into two, U-Pack’s team will pick up the third at no additional cost to you. U-Pack can deliver up to four containers on a single truck, which meets most customer’s needs. Like PODS, ReloCubes sit flush with the ground, so you don’t have to navigate a ramp in order to load your container. Alternatively U-Pack also offers a 28′ moving trailer, which can accommodate the contents of most 3-4 bedroom homes. With this option, customers can pay for just the amount of space they use, whether that’s a quarter of the trailer or the whole thing. 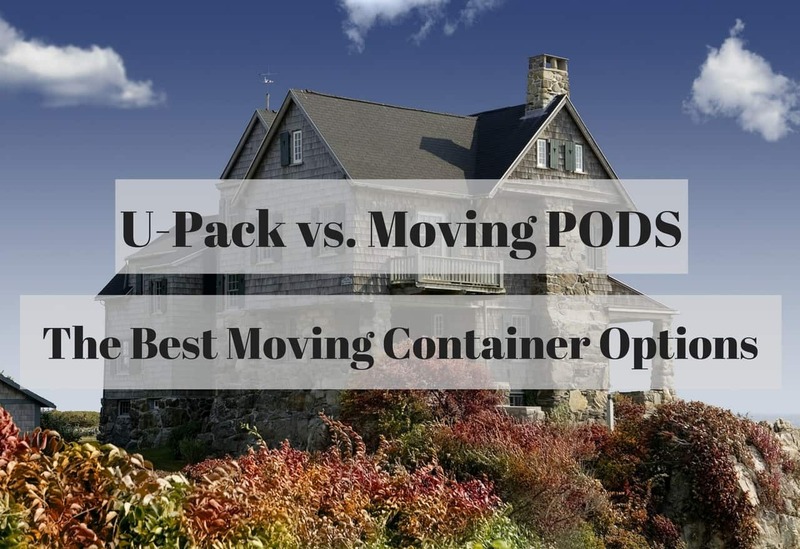 When considering whether to go with U-Pack or PODS, make sure you think about how many containers you’ll need to accommodate all of your belongings. U-Pack seems to offer more flexibility by allowing you to purchase space in smaller increments, whether it’s using multiple ReloCubes or utilizing just the space you need in a moving trailer. Moving containers also offer a great option for short-term storage. When it comes to moving, rates are particularly important, but so are the terms of payment. In general, moving via a shipping container is less expensive than hiring a full service long distance moving company because you do all the loading and unloading yourself. While PODS and U-Pack are both affordable long distance moving solutions, the companies differ when it comes to payment terms. PODS requires customers to pay the entire amount for the container up-front upon delivery, while U-Pack allows customers to pay when the containers are delivered to your new residence. Though you’ll have to pay either way, you’ll want to consider both personal preferences and which option is best given your cash flow situation around the time of the move. Whichever service you choose, both U-Pack and PODS offer great moving solutions at reasonable rates. Best of all, these companies both eliminate the need to transport your belongings yourself, which is one of the biggest drawbacks of a completely DIY move. Get reliable moving estimates for your upcoming move to compare the cost of professional movers vs the container option. Find trusted rates and affordable pricing (greatguyslongdistancemovers.com) for your next long distance move.